Originally featured in the Omaha World-Herald on April 12, 2014. In 1913, the Village of Dundee contracted with the City of Omaha for use of the Omaha Public Library. Dundee was annexed by Omaha in 1915. As the community grew, so did its demands for a neighborhood library. By 1973, the Recreation and Education Association of Dundee was formed to champion the cause, and it set its sights on a vacated Hinky Dinky store at 50th and Underwood Streets. A petition circulated to gather community support, and more than 2,500 signatures were collected in favor of the new facility. Early estimates to renovate the store were expensive, and soon a new opportunity emerged. Learning of the community's need, former Mayor A.V. Sorensen agreed to donate an acre of land at 48th and Cass Streets for a multi-use facility, under the provision that it would be built within the next three years, or be transferred back to Sorensen. The building was designed by Bahr, Hanna, Vermeer & Haecker Architects as a split-level facility, featuring a recreation center on the first floor and a library on the second. 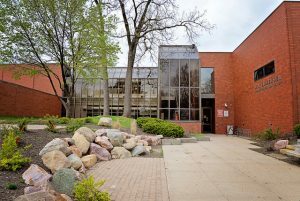 The building opened on Aug. 2, 1976, and was named for Sorensen in recognition of his donation of the land, as well as his contributions to Omaha as a civic leader, philanthropist and humanitarian. Sorensen's community involvement went well beyond his service as mayor from 1965-69. He served on many boards and committees over the years with diverse and far-reaching interests, including the establishment of the Boys Clubs of Omaha Inc., and work with many other organizations to benefit youth. A year after opening, Sorensen Library realized a good problem — all of its books were being checked out, and the library desperately needed more to meet the demand. Once again, Sorensen stepped up and donated $5,000 toward adding to the collection, and the City of Omaha more than matched the gift with an additional $10,000. Today, Sorensen Library continues to serve as a neighborhood hub with educational and entertainment opportunities for residents in and outside of the Dundee area.